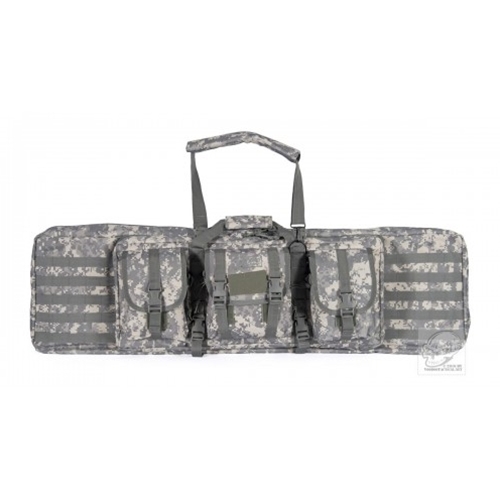 Whether you are carrying your rifle to the range or need to pack it in the field, this Voodoo Tactical brand padded weapons case is a terrific way to carry two long guns, two pistols and a great deal of related gear. The 42-inch (40.5-inches inside) padded case from Voodoo Tactical safely holds just about any compact rifle or carbine. Three gusseted exterior pouches hold ammo, magazines and accessories. Backpack type straps allow you to easily carry your guns and gear into the field. Behind the pouches, there's a second compartment with two padded pouches built in. Each is designed to hold a pistol, but you could also use these for optics or other accessories.This case comes with the three external pouches you see here, giving you plenty of storage space for magazines, boxes of ammo, cleaning kits, your log book and other accessories. The three exterior pouches have gussets, making them hold far more than you would think. The two outside pouches can hold five or six magazines and the center pouch is even larger.